The typical Battery Charging Control system on newer RVs will give priority charging to the primary battery system depending up the mode of operation. When the coach is first started, the alternator may not immediately begin charging the Chassis / Starting Battery because the control system is designed to allow the engine to stabilize after starting before adding the full load of the alternator to it. At that point, the control system connects the alternator to the Chassis battery and it begins to charge the Chassis battery. As that battery approaches full charge, then the Controller engages the Coach battery while maintaining the Chassis battery as electrical demands are placed on it to power lighting, engine and transmission management systems and so on. As both batteries approach full charge the Battery Charging Control system goes into a maintenance function periodically checking each battery group for charge level. When the engine is off and the coach is connected to 120 Volt AC, the convertor or inverter/charger will supply charging voltage first to the Coach battery system and once that battery reaches a predetermined threshold level, the Chassis battery will be connected to the charging system. Modern charging systems will initially "bulk� charge at a higher voltage and provide up to their full rated capacity to rapidly charge the batteries, then the system will drop to an "absorption� charge state which tapers off the charging voltage and current to bring the batteries to a full charge. Once that level is attained then these charging systems operate in a "float� charge mode periodically checking the batteries and "topping them off� then going dormant, cycling as required to maintain full charge given the demands of the coach electrical system. Most newer RVs can temporarily link the two battery systems together to Boost a low Chassis Starting battery using a dash or driver area mounted momentary contact switch which, when pressed, connects the Chassis / Start and the Coach Batteries together so that sufficient power is available while to start the engine. This feature usually employs parts of the charging system that connects the batteries together in the various charging functions. In the unlikely event that the RV is not able to be connected to 120 Volts AC (such as in storage) and the Boost Switch will not provide sufficient power to start the engine (indicating that both Chassis and Coach Batteries are low) then it may be possible to use the coach batteries to start the generator which will then power the convertor or inverter/charger to charge the batteries. Leaving it running for a period of 30 to 60 minutes may provide enough power to then use the Boost or Aux. Start switch to start the engine and allow the alternator to take over the charging task. 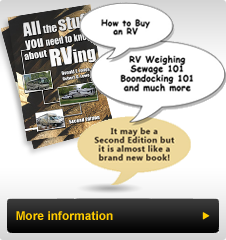 Should the alternator fail, running the generator to power the Coach battery charging system should allow the RV to be driven to a service facility to be repaired. It should be noted that using two methods to charge batteries is not in itself harmful. Leaving a generator running to provide power to a converter or Inverter/charger to recharge the coach battery system while driving in addition to having the alternator charge the chassis battery will usually bring both systems up to full charge quicker than relying on one method of charging alone. Some control systems may preclude this alternative however having ample power available may give the control system a greater ability to recharge all of the batteries on board in a shorter period of time. The batteries do not "care� which power source is providing the charging current necessary to bring the batteries up to full charge.